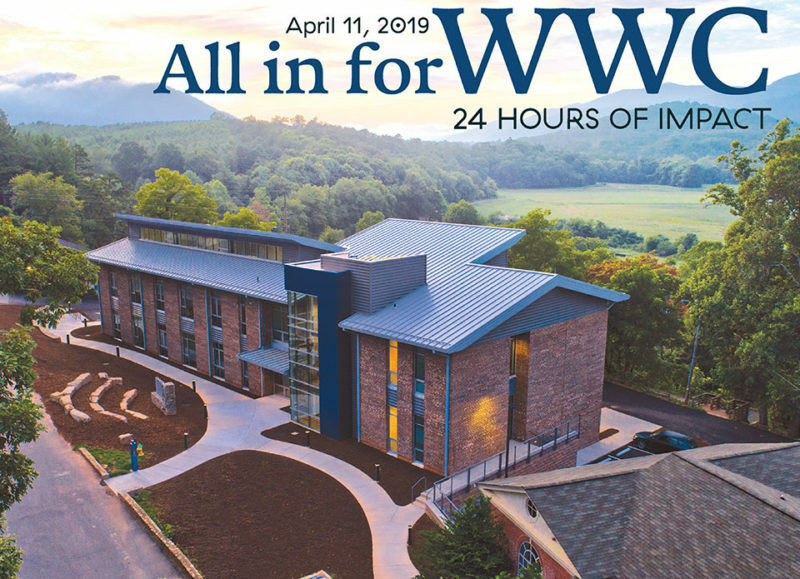 Join us as we go “All-in for WWC” with a day of giving to Warren Wilson College! Your Giving Day gift will be doubled thanks to the generosity of a group of our alumni and friends who pulled together to offer a matching gift up to $40,000! Throughout the day we will be raffling off prizes for all donors who have given up to that point. The earlier you donate the more chances you have to win! But wait, there’s more… for one day only, all credit card fees will be waived increasing the impact of your gift even more. Click the link above to join the fun! Start your day by going All-In(to) your cup of joe and pastries with fellow students, faculty and staff. At the event, you’ll be able to make your Giving Day gift and enter your name into the various raffles throughout the day! In addition, senior class donors can pick up their special WWC alumni sticker. The earlier you go #allinforWWC the more raffles you are entered into throughout the day! Tune in to Facebook on April 11th to see what cool prizes you might win. Follow us on Instagram @warrenwilsoncollege as we have various student contests throughout the day. Student winners get a visit from the one and only swag bandwagon. WWC is filled with a community going “All-In” with various talents. Follow us on Facebook to see who performs at our Giving Day halftime show. Hopefully we’ll be able to catch up with the horses as they cruise through campus spreading joy and cheer (and, of course, swag)! Back by popular demand, come join us at Gladfelter or watch our live stream as alumni, students, staff, and faculty face-off to see who is victorious in this uniquely Wilson event. If you see an 828 number in your phone during this time, pick up the phone and see what crew member gave you a ring. It might be someone representing your old crew. Remember that 828 is great! 3pm: Yes, It’s True, Another Raffle! The first 125 donors that join the Heavy Duty Society ($10+ recurring monthly gift) or $100+ donor will get a plot in Bell Pepper, the milking cow’s, pasture. If Pepper plops in your plot, you win a prize! Come join the fun on Orr Cottage Patio and celebrate being #allinforWWC! We’ll have drinks and snacks and music for all to enjoy as we check in with alumni and friends all across the country who are hosting events on this very special day. 6pm: Final Raffle of the Day! Why Not You! ?